The tortured artist is as predictable a stereotype as the jolly fat man. All art is a form of communication, and most works substitute one sense (sight, sound, taste) for another. The Pain Exhibit covers just about the entire landscape of life and, consequently, of pain: fear, love, torture, loss of faith, acceptance, hope and transformation. Some of the images from the exhibit depict the physical side of pain; others convey the emotional challenges of chronic pain. Selections from the Pain Exhibit. To see a slide show, click here. Pain doesn’t show up on a body scan and can’t be measured in a test. As a result, many chronic pain sufferers turn to art, opting to paint, draw or sculpt images in an effort to depict their pain. 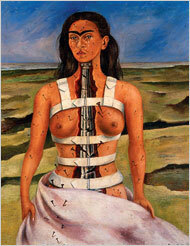 One of the most famous pain artists is Mexican painter Frida Kahlo, whose work, now on exhibit at the Philadelphia Museum of Art, is imbued with the lifelong suffering she experienced after being impaled during a trolley accident as a teenager. Her injuries left her spine and pelvis shattered, resulting in multiple operations and miscarriages, and she often depicted her suffering on canvas in stark, disturbing and even bloody images.